The Rockefeller Foundation (“Foundation”) has a stated mission to promote the well-being of people throughout the world that has remained unchanged since its founding in 1913. The Foundation has long held that progress and rising standards of living for all groups can be achieved with the adoption of thoughtful policies aimed at promoting the well-being of people throughout the world. Today, that mission is being adapted to an era of rapid globalization. The Foundation envisions that this century can be one in which globalization’s benefits are more widely shared and its challenges more easily weathered. To realize this vision, the Foundation seeks to achieve two fundamental goals. First, it seeks to build resilience that enhances individual, community and institutional capacity to survive, adapt and grow in the face of acute crises and chronic stresses. Second, it seeks to promote growth with equity in which the poor and vulnerable have more access to opportunities that improve their lives. Through its Poverty Reduction through Information and Digital Employment (PRIDE) work, the Foundation is working to foster and develop a new arm of the outsourcing industry called Impact Sourcing (IS) to create employment opportunities for poor and vulnerable people. 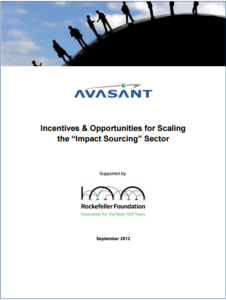 Toward this objective, the Foundation is supporting the development and testing of Impact Sourcing business models, research around the enabling environment and the continued building of a network of key stakeholders to advance the Impact Sourcing sector.